The enchantment of nature and a fascinating history, a stone’s throw from the sea. The island’s true essence in the fragrant embrace of the countryside and the sea: La Chiusa‘s guests can forget the bustling, commercial Elba of the holiday season and immerse themselves in the atmosphere of bygone ages. An enchanting location for relaxing, romantic holidays for couples or families, surrounded by vineyards and ancient olive trees. 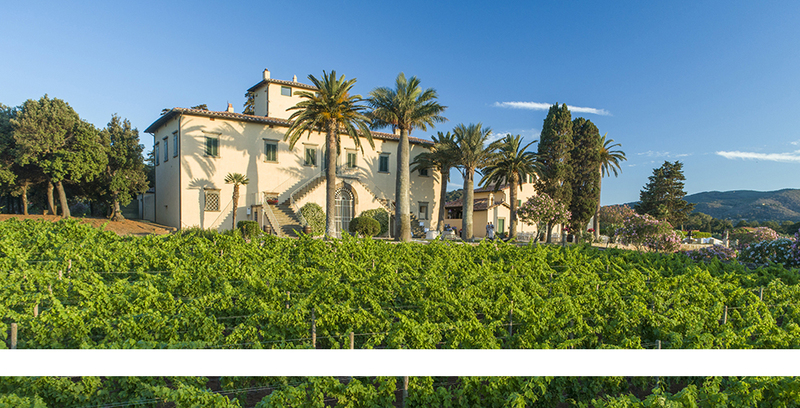 The estate overlooks the gulf of Portoferraio and takes its name from the walls which enclose its 20 hectares of land, mostly vineyards and olive groves. The main business is the production and retail sale of Elba’s traditional wines (the reds and whites, the rosé and Aleatico) and cold-pressed extra virgin olive oil. Its origins can be traced to the late 16th Century, when the cellars and the old hamlet were built. The walls and main house date from the early 19th Century. Napoleon Bonaparte also stayed at La Chiusa on two separate occasions: the first time just after his arrival on the island, while he waited to be received with the appropriate pomp at Portoferraio, and again after a day’s hunting on Mount Fabbrello. The historic buildings have been carefully renovated using the original materials and are now holiday apartments. There are 10 apartments, all different, simple but with a special appeal.